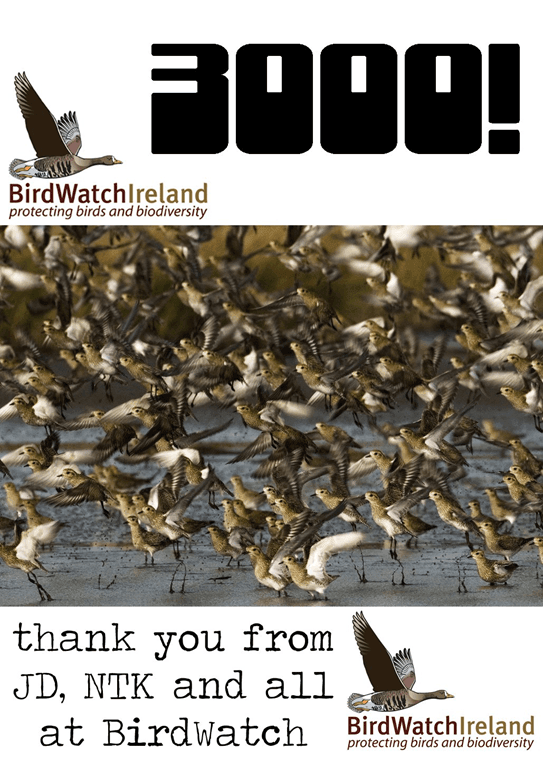 Okay… the Birdwatch Ireland page on Facebook hit 3,000 likes today (see the rather fetching image they posted to their page to celebrate). We’re languishing on a paltry 1763 (actually, I think that’s pretty good, but I know we can do better). Think about it… birds ARE wildlife… but there’s much more to wildlife than just birds. Logically, if 3,000 people like Birdwatch Ireland AT LEAST as many must be keen on Ireland’s Wildlife. Stands to reason. Not that it’s a competition, of course… the more people who like anything to do with wildlife, on Facebook, and in real life, the better! So come on… tell all your friends to like the Ireland’s Wildlife page on Facebook. You know it makes sense! And by the way… congratulations to NTK, JD and the rest of the BirdWatch gang on reaching a significant milestone on what is a fabulous Irish Facebook Page.